This is the category for Products and Services. 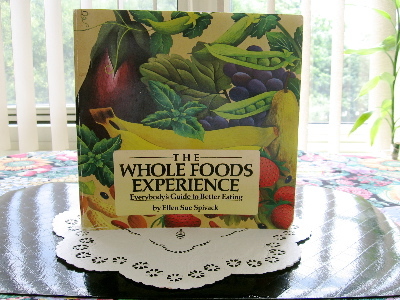 The first product I would like to offer is my largest cookbook, The Whole Foods Experience published by Ross Books, Berkeley, CA. I wrote it as an introduction to natural foods, early in my vegetarian history and after the birth of my third child, when I had already made major changes in my diet and lifestyle. The chapters include Getting Started, Essential Utensils, Whole Hints, a Resource list, and of course, recipes for every meal, snacks, and includes Good Food for Special Problems and food for babies. The 248 page book has many recipes that are easy to prepare. Some will be featured in my blog articles on food with recipes from The Whole Foods Experience. Or I may use a variation of a recipe. Below is a sample recipe with some small changes for midlife menus (ex. I added flax seeds) and more condensed directions that I have developed with experience. 1. Oil muffin tins and set aside. Preheat oven to 350 degrees F.
3. Place wet ingredients (except for dates) in the blender & puree. 4. Pour wet ingredients into the bowl with dry ingredients & combine well. Add flour-coated dates and mix into batter. 5. Bake at 350 degrees for about 20 minutes or until an inserted toothpick comes out clean. Yield: 1 1/2-2 dozen muffins. 1. Substitute soaked raisins or pitted prunes for dates. 2. Add one cup sunflower seeds or chopped walnuts or pecans. To place an order, contact me at menupause.info@gmail.com and I will email you ordering information. Note: If you want me to sign it or you are giving it as a gift, I would be happy to put a message inside with the person’s name and mail it to the address you provide. The first service I am offering is HERS (Health Education Resource Service). If there is a health topic you want researched, I’m your woman! The cost is $25 per hour. You decide how many hours you want me to spend researching a health topic on the Internet and in my reference books and I will email or snail mail all the information. If you also want a personal phone consultation to can discuss the information, add $25 for the phone consult. Please email me with your request. Use my yahoo address: menupause.info@gmail.com. This week’s posting in Kitchen Nutrition with Recipes is somewhat a continuation of last week’s article: Chill Out with Raw Foods, because the recipes in Thyme on My Hands require no cooking, as well. Before proceeding further with any more postings, I decided to make an index, so that in the future, new readers as well as early blog readers can find a topic or recipe with ease. Thanks to my helper Dorothy for scanning all the archives for the recipes. Also, Barb Jarmoska’s profile, as well as future postings in Profiles, will probably stay on the site for one month, so that new readers will have time to read it, and I will have time to research a new woman to profile. If there is someone you think should be in this category, please send her name and any other pertinent information to contact her. Remember, this category is for Women of Power, Women of Strength, with power in the positive sense of making a difference in her life and the lives of others. So, for this week, click on Kitchen Nutrition, Feedback, Health Flashes, and Peek 2 Pique for new postings. Finally,on the advice of one or two readers, I am looking into a program that will review each recipe for fat, protein, carb, and calorie content. This may take awhile, but when I find a good one, I will eventually apply it to all the recipes. My website/blog is always a work in progress. Your ideas and suggestions are not taken as criticism, but rather as good will ideas to make the site better and better. So thank you to everyone who responds and I may put some of those responses in Feedback, with your permission. I hope you will find the “time” to check out this week’s Thyme on My Hands and enjoy one of the recipes. I just had the chilled cucumber soup and thyme salad again yesterday and they taste like summer! You are currently browsing the Menupause weblog archives for July, 2006.